Facebook Live is more than a tool for speaking to your audience. It provides another form of exposure to your business. It allows you to connect with your audience on a personal level. In turn, it also allows your audience to engage with you. You can also use this effective marketing tool to grow and build your email list. People are much more likely to sign up for your list if they connect and engage with you in person, even if it is over video. Not only can you use Facebook Live to grow your list, you can also use it promote your brand, products, and services. Be consistent. Choose a specific time each week to go live. Being consistent in how often you speak to your audience will increase your influence and personal connection with them. Include a link in the comments. Immediately after you end your Facebook Live, include a link to your email subscription’s landing page. Anyone who was watching the Live or watches it later, will have an opportunity to sign up for your list. Tell them why. The title of your free resource will tell subscribers what they are signing up for, but it may not tell them why they need it. Let them know what results they will get when they apply the information you are sending them. Share in-depth explanations. Longer videos allow the opportunity for more live viewers. You will attract a larger audience when you share your expertise over a longer amount of time, then if you simply pop on Facebook for a few minutes. This also gives you extra time to promote your free resource without overdoing it. Remind them they can sign-up to receive more helpful information regarding what you are teaching. Be yourself. The more someone gets to know the person behind the business, the more likely they are to relate and connect with you. The more they relate to you, the more likely they are to trust you. Once they trust you, they will have no problem allowing you into their email inbox. Connection is so powerful. 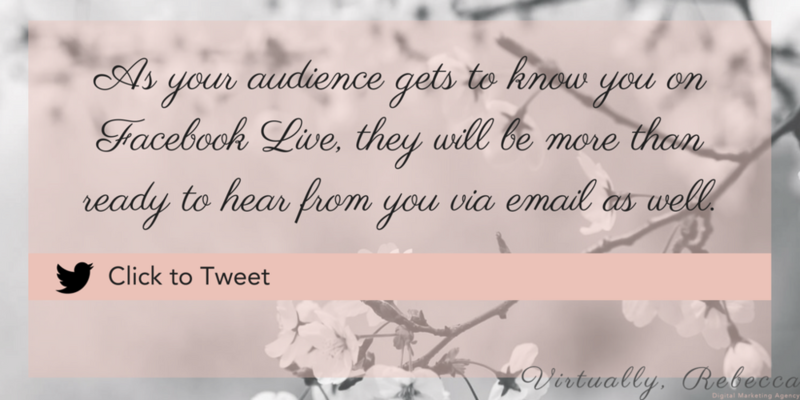 As your audience gets to know you on Facebook Live, they will be more than ready to hear from you via email as well. Drive traffic to your Facebook Lives. Once you have gone live on Facebook, that video is on your timeline forever, unless you decide to remove it. Use your other social media platforms to promote your weekly live streams. This increases the exposure of your Live exponentially, directing even more people to sign up for your email list. Facebook Live offers a multitude of ways to grow your email list. Through being consistent and showing your audience your “real” self, you will build that know, like, and trust factor. I would love to help you maximize Facebook to build your email list. Follow this link here to schedule a free consultation with me today.